Splendour Rock — it does sound like a place you’d read about in a fairytale. The irony is, it could easily be mistaken for being make-believe when you get up close to it, trust us. There are alternative ways to reach Splendour Rock, the more popular being to start from Dunphy’s Camp and walk the 24km loop from there. 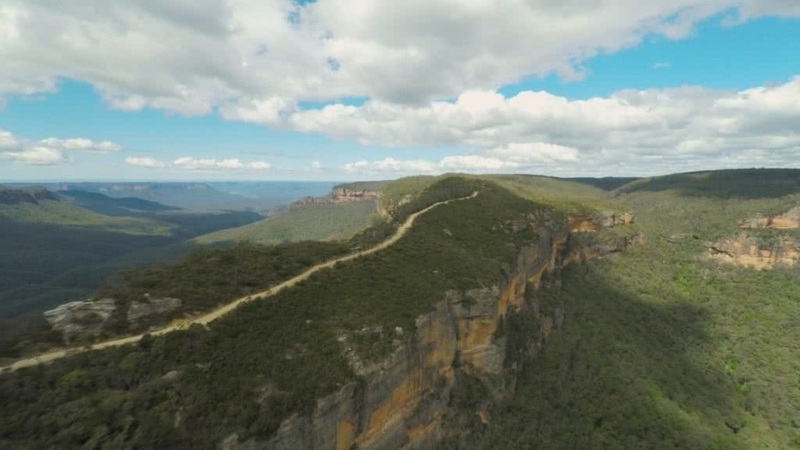 Our gang of 8 opted for an alternative route though; a 2 day adventure loop riding the fire trail (which starts from the car park and gate area on Narrow Neck trail) and trail walking to reach the campsite at Splendour Rock. The ride is nothing short of breathtaking; the fire trail follows a dramatic ridgeline with 250m cliffs drop offs on either side. It’s like nothing I’ve seen in Australia and we were glad to take our time to complete this leg of the adventure as it really is something special. We were also lugging backpacks so we weren’t the most aerodynamic! The spring sun beamed brilliantly as the fire trail came to an end and after a munch stop and gaze out to lake Burragorang, we locked our steeds and transformed into hiking mode, following the the descending path via Tarros ladder (a rather sketchy set of metal bar steps that drop 20m down a cliff face — a ring-tightening manoevre with bulky backpacks on) before continuing down to Medlow Gap. A little further on we picked up the right turn towards Kennel Flat and followed it through towering gums until we reached campsite clearing at Mobbs Swamp. Here we located a cave (down to the right) beside which a well flowing stream ran, providing the perfect opportunity to refill for the next 24 hours. Shortly after the campsite a trail peeled up to a huge plateau on the left, a calf shredding final ascent to Mount Dingo that left us in a trench of sweat and armed with growling bellies. Thankfully this was the end of the laborious stuff; after 1km along the plateau we found ourselves standing proudly upon Splendour Rock, one bent leg raised slightly upon a ledge as the sun set behind the almighty (and terrifyingly named) Wild Dog Mountains. The camping area at the top is as basic and as beautiful as anyone could wish for. We settled into a cluster of giant rocks for the night and proceeded to cook the signature Captain Cunglebung Brazillian BBQ swoshed down with red-wine chasers and chitter chatter. The weather on Day 2 took a turn for the worse so our shortcut return was thwarted by the sketchy rocks that were just too slippy to attempt clambering down at the northern end of the plateau. We backtracked to our original route and fought through increasing torrential rain until we got back to Tarro’s ladder. Tarro’s ladder had now effectively become a waterfall; the metal bar steps holding less traction than a cartoon banana skin. We took off our backpacks and opted to rope them up instead, however our guy-rope didn’t quite cut the mustard so we formed an exemplary human chain and winched them to the top that way instead. Climbing this without a bag was utterly terrifying and I would urge extreme care here. Once at the top of the climb we located our gaggle of mountain bikes and quickly morphed back into bike mode, disappearing back down a foggy Narrowneck Trail with one thing on our minds…the heating of our cars. Intermediate to advanced — this adventure requires good preparation and decent level of fitness. The path can also be overgrown in parts so can be easy to get off trail. Strong map reading skills and navigation essential.